This post is part of Researchly’s weekly Blockchain and Crypto report covering ICOs, Dapps, and news sentiment. You can read the full ICO report here and the full news report here. 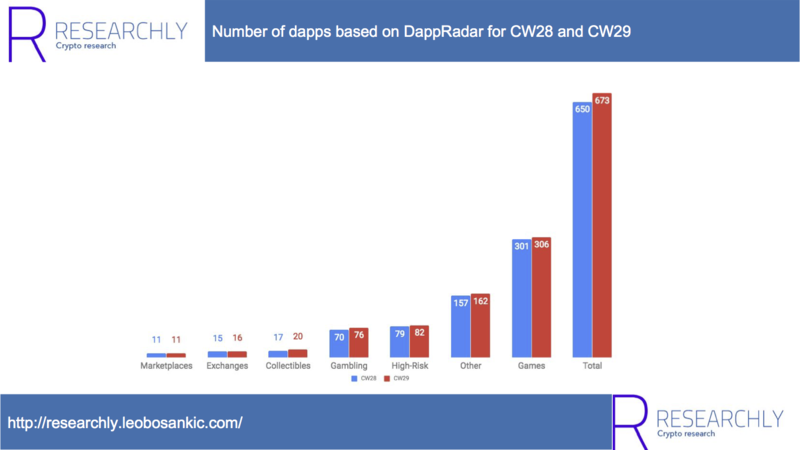 Here I am looking at highest-ranking Dapps (based on Tx 7d; see Methodology for more) from Dappradar for CW29 (15.07.2018 – 21.07.2018). As shown in this week’s ICO report and last week’s ICO report, ICOs are becoming less interesting. In regards to Dapps, it is not much different. Most Dapps are about Gambling or Gaming and even there we see little traction yet. Similar to last week’s Dapp report Fomo3D (and corresponding copies) were the most popular Dapps. 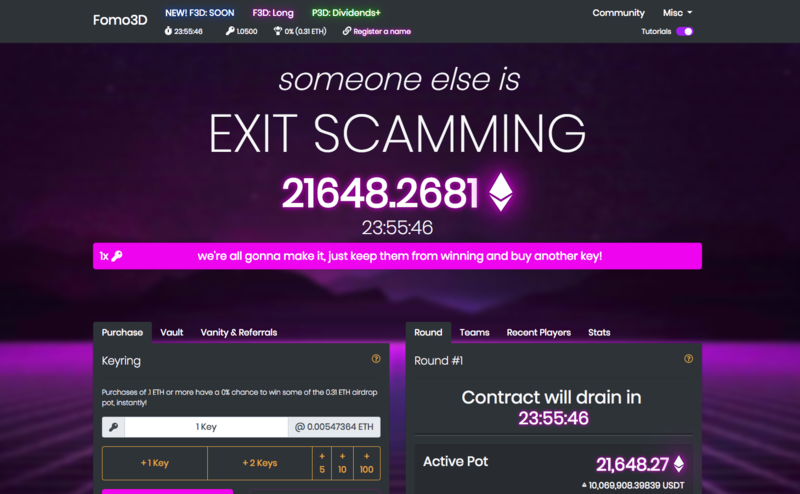 Fomo3D, which launched around three weeks ago, is a lottery with a counter where gamers buy into a pool and the last person to purchase a ticket before the counter expires receives the whole pot. The current pot holds around $10Mio. and expires in 24h. Last week it was around $488k. Considering how much money is locked into such gambling platforms and the $20,000 paid out to Augur users one could get the impression that earning in crypto has gone from ICOs to Dapps. Dapps…when moon? Also, like last week, the prediction market Augur was fairly popular (they went live two weeks ago). Notably, this was before the assassination markets hit the news. Marketplaces for crypto collectibles could become pure discovery platforms because their traditional major advantage – establishing trust – is now ensured through code. This is an intriguing difference to traditional marketplaces like Amazon. Prices of crypto collectibles rise significantly early on. This might discourage early adopters from joining. For instance, 0xUniverse (a space game) launched about two weeks ago and the most expensive items there already cost around $1800. We have already seen this with the mainstream popularity of Cryptokitties but this must not become an emerging pattern if collectibles should go mainstream. If the attributes of crypto collectibles are not presented visibly, a purchase is discouraged. This is a small UI aspect with great impact. If it is not immediately visible why a certain collectible (e.g. a planet) is special users won’t see any justification for spending money on it. 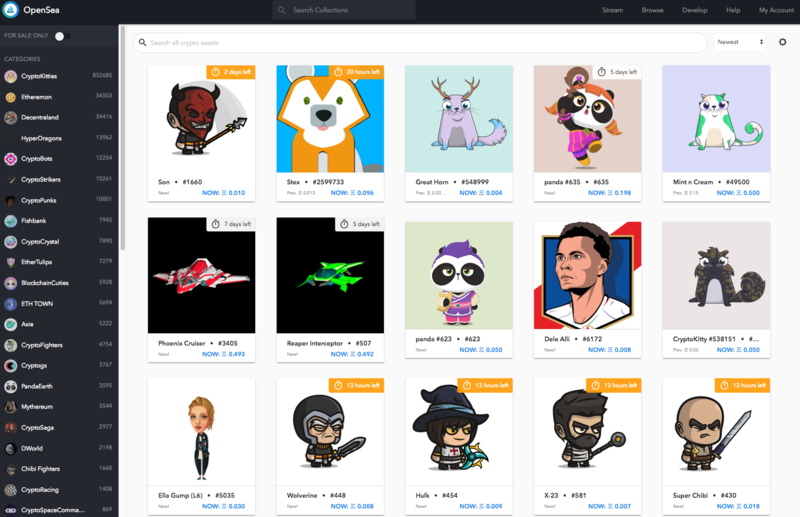 Internal marketplaces: Marketplaces such as Decentraland’s marketplace which are only used within their respective dapp. I tried OpenSea, a marketplace for crypto collectibles. 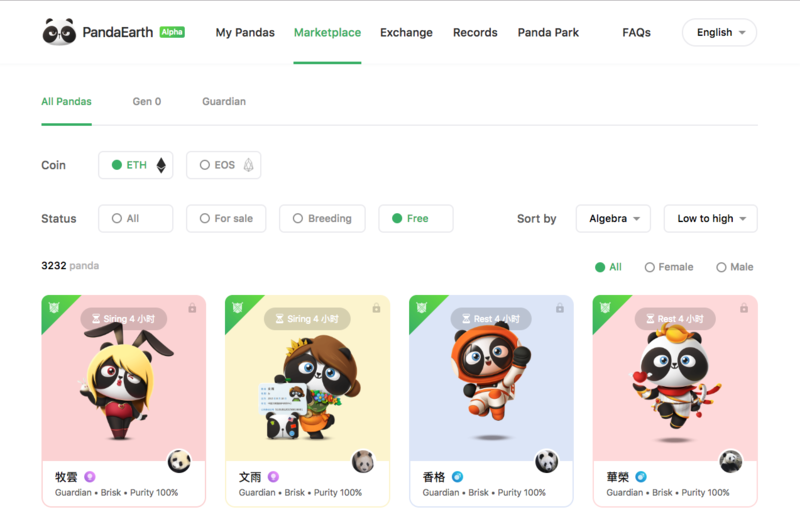 I bought a panda at Panda Earth (trading cryptopandas; see below) and sold it on OpenSea. After my first attempt failed (due to too low GAS), the second one was successful. More broadly, a comparison between Panda Earth and OpenSea puts the role of marketplaces in question. As the screenshots below show, Panda Earth does not provide more information than OpenSea. Moreover, universal marketplaces have higher liquidity than stand-alone ones. In contrast, universal marketplaces have disadvantages like fees or higher competition. Nevertheless, the major influence on the role of marketplaces will have the need for trust. The biggest advantage of traditional marketplaces like Amazon (traditional in the sense that they do not trade cryptoassets) is trust; Amazon ensures that no seller or buyer is defrauded and takes care of disputes if a trade goes wrong (e.g. a seller delivering a broken product). This trust also ensures that the trading partners stay on the platform after their initial exchange. After doing business for the first time, both parties know of each other and do not need the platform for discoverability anymore. However, as both could still be cheated, they remain on the platform for safety reasons. Crypto marketplaces differ in this regard as they do not need trust; all trade conditions are encoded in code. With this in mind, the role of crypto marketplaces could be one of pure discovery platforms. Buyers will use them to find new offers and after the first purchase deal directly with the dapp’s marketplace because it offers a better UX (e.g. more configuration options) and lower prices (because the dapp must not pay marketplace fees). Similar to how Fomo3D ranked first based on users last week, this week it was #1 based on Tx 7d. 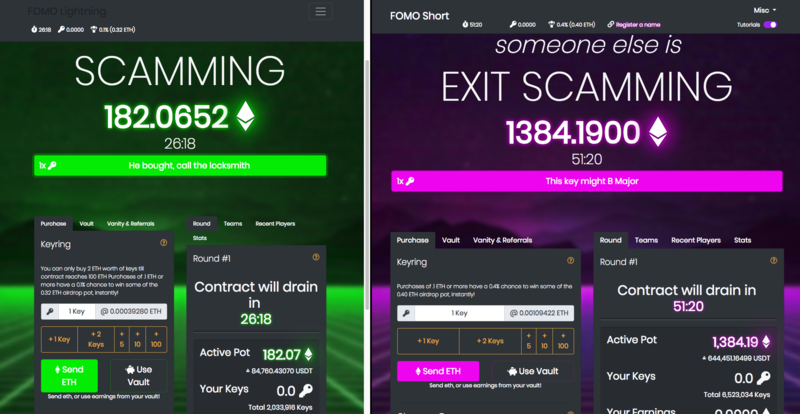 Fomo3D, which launched around three weeks ago, is a lottery with a counter where gamers buy into a pool and the last person to purchase a ticket before the counter expires receives the whole pot. The current pot holds around $10Mio. and expires in 24h. Last week it was around $488k. It also seems that Fomo3D’s large pot has motivated others to create “AltFomos” (i.e. a copy of another Fomo-pot) such as FOMO Short and FOMO Lightning which strongly resemble Fomo3D. As a side note, according to two Redditers Fomo3D itself is an AltFomo of Ether Hell. For context, it should be mentioned that Etheroll (ranked #2), an online casino, has been on the market longer than Fomo3D and raised $300 Mio. in their ICO in February 2017. Considering all these FOMOs and the $20,000 paid out to Augur users one could get the impression that earning in crypto has gone from ICOs to Dapps. Dapps…when moon? Last week I ranked the Dapps based on users/transactions so the comparison to this week (based on Tx 7d) is not 100% accurate. Nevertheless, the ranking was still quite similar. I played around with 0xUniverse a space game where you explore the universe, build spaceships and buy planets. What I still find annoying (with all Dapps) is that MetaMask opens in a new window. This is especially disturbing when the browser runs in full screen on Mac and MetaMask opens in a new full-screen window. Besides that, 0xuniverse was a little bit slow and buggy when I opened it for the first time but else it performed smoothly. Besides that, I missed a fiat donated price within the Dapps. 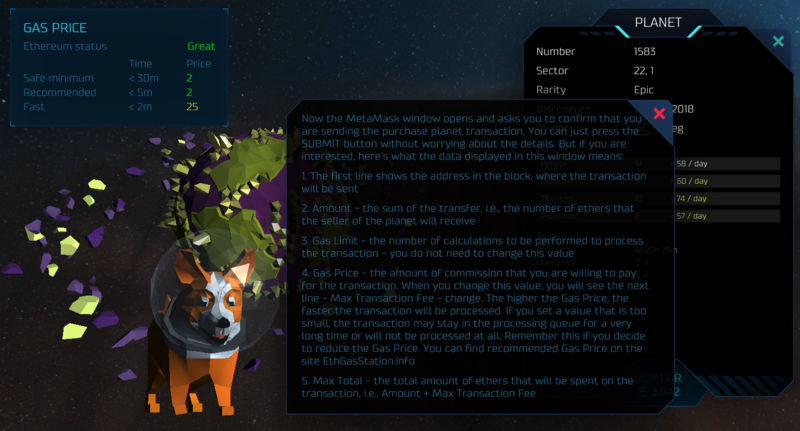 Every time you want to know a planet’s price, you must open MetaMask. This disturbs the UX quite a bit. Interestingly, despite its recent launch, some planets are already very expensive, the most expensive one trading for $1800. This might discourage early adopters from joining. I played around with Panda Earth. Panda Earth sells CryptoPandas, virtual pandas mapping 50 real-life pandas licensed by China Panda Conservation and Research Center. Like real-life pandas, CryptoPandas can have descendants. And they look extremely adorable. 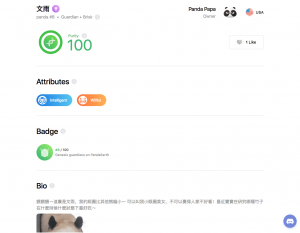 As typical for cryptoassets, each panda has its specific attribute and history. Exploring CryptoPandas’ attributes was surprisingly pleasant; they were easily recognizable and plenty. This is an important UI aspect because it gives each panda its uniqueness, the “investment” is far more understandable, the game more engaging, and it encourages social sharing. This stands in sharp contrast to 0xUniverse where a planet’s attributes are not immediately visible. As such, the planets do not feel special or unique and do not encourage purchases. PoWH 3D (previously named PoWH) has been around for half a year and DappRadar founder Skirmantas Januškas calls it the biggest pyramid scheme on Ethereum so far — PoWH3D. With PoWH3D every purchase includes a 10% transaction fee that is distributed to all token holders. As such, PoWH3D is only sustainable if users keep buying. And so every holder is inclined to convince new buyers to keep the scheme going. Th 0x Protocol launched its 0x Portal, a dashboard for discovering and accessing 0x relayers, last week. According to Brandon Millman, Tech Lead and Growth Engineering at 0xProject one of the motivations behind the 0x Portal was “User education and on-boarding”. Indeed, on the first try, the 0x portal works very well. Surprisingly positive was also that it explains the necessary concepts (e.g. WETH) well enough to understand how to trade. However, negative was that some relayers introduce unnecessary redundancy by explaining these concepts as well. You can read more about the 0x Portal in Introducing the new 0x Portal written by Brandon Millman, Tech Lead, and Growth Engineering at 0xProject. Another high-risk Dapp I tried was ThisOrThat.io. ThisOrThat.io is a polling game with two predefined answers. Although entertaining, it was surprisingly inconvenient that each vote must be submitted via MetaMask. Dapps with such frequent submits are likely to prevent people from using them. Dappradar uses seven metrics for dapp-performance (balance, Users 24h, Volume 24h, Volume 7d, Tx 24h, Tx 7d, and Activity 7d) but I use only Tx 7d for ranking the dapps. There was a total of 673 dapps, most of them in Games (306), High-Risk (82), Gambling (76), and Other (162; although I would re-categorize some into other categories). Compared to last week there were 23 new apps (4% increase). 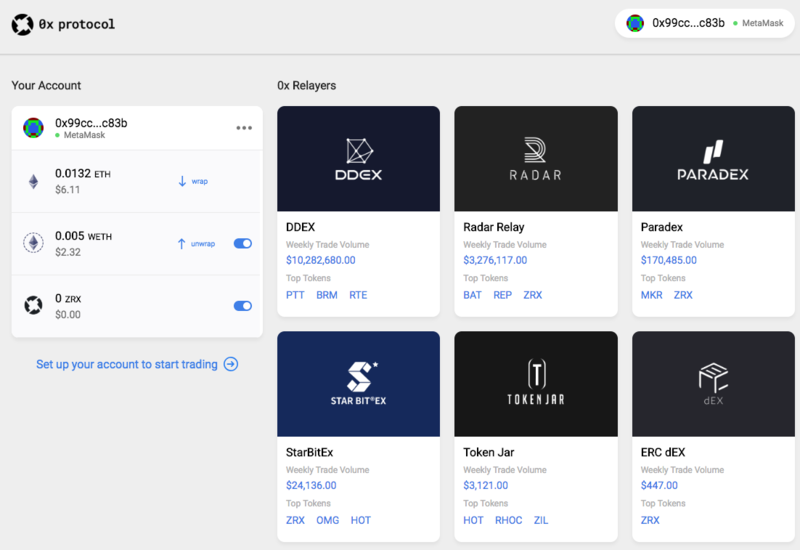 Every category except Marketplaces saw new dapps (there was also only one new Exchange).